NASA's Mars Exploration Rover Opportunity used its navigation camera to capture this view of a northward-facing outcrop, "Greeley Haven," where the rover will work during its fifth Martian winter. 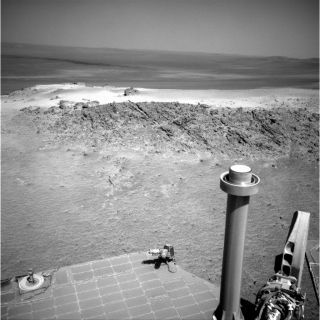 This image, taken by Opportunity on Nov. 29, 2011, was released Jan. 5, 2012. NASA's Mars rover Opportunity has found a good place to wait out the harsh Martian winter — and to get some more science done as well. Opportunity is hunkering down at a spot called Greeley Haven, a rocky outcrop along the rim of the Red Planet's huge Endeavour crater. The site allows the rover to angle its solar panels toward the sun, and it also presents a variety of interesting features for Opportunity to investigate, researchers said. "Greeley Haven provides the proper tilt, as well as a rich variety of potential targets for imaging and compositional and mineralogic studies," Jim Bell of Arizona State University (ASU), lead scientist for Opportunity's panoramic camera, said in a statement. NASA's Mars Exploration Rover Opportunity will spend its fifth Martian winter working at a location informally named "Greeley Haven" in 2012. The golf-cart-size Opportunity landed on Mars on Jan. 25, 2004, three weeks after its twin, Spirit. The two rovers were originally supposed to spend 90 days looking for signs of past water activity on Mars. Both solar-powered robots found plenty of such evidence at their disparate landing sites, and they just kept chugging along, continuing to gather data years after their warranties expired. NASA declared Spirit dead just last year, and Opportunity is still going strong. This is Opportunity's fifth Martian winter, but the first one it will spend parked on a sun-facing slope. Sunlight is relatively strong year-round near Opportunity's landing site, which is just south of the Martian equator. This year, however, the robot's solar panels are carrying an especially heavy load of dust. To make sure Opportunity stays powered up, engineers drove it to a spot where it could tilt its panels northward about 15 degrees, maximizing solar exposure. Opportunity will stay awake throughout the Martian winter, studying Greeley Haven's rocks and perhaps even moving a few feet now and then. The rover team also plans to track radio signals from Opportunity, using the robot's movement to get very precise measurements of the Red Planet's spin. This information could reveal information about Mars' interior structure, researchers have said. The rover will likely roll out of Greeley Haven and continue exploring larger swaths of Endeavour Crater's rim — which it reached this past August after three years of travel — by June or July. Greeley Haven is named to honor Ronald Greeley, a professor of planetary geology at ASU who died on Oct. 27, 2011. Greeley was involved in many robotic missions to Mars, including Mariners 6, 7, and 9, Viking, Mars Pathfinder, Mars Global Surveyor and Spirit and Opportunity's mission. He was also a co-investigator for the camera system on the European Space Agency’s Mars Express orbiter mission, researchers said. Greeley Haven is an unofficial name at the moment, but Bell and others hope the late scientist gets a more official nod someday. "We hope that eventually the International Astronomical Union will name a crater or some other feature on Mars or some other solar system body for Ron," Bell said. "But that process typically takes years." In the meantime, he added, "this small commemoration helps preserve the memory of Ron’s contributions to planetary science within the community and beyond."